WASHINGTON — The National Marine Manufacturers Association is asking the marine industry to try to get support for the Sport Fish Restoration & Boating Trust Fund, a $600 million-a-year fund that helps fund fishing around the country. David Kennedy, of BoatUS, told American Boating Congress attendees on Tuesday that the money not only contributes to boater safety programs and education, but also directly helps improve docks and other boating infrastructure. 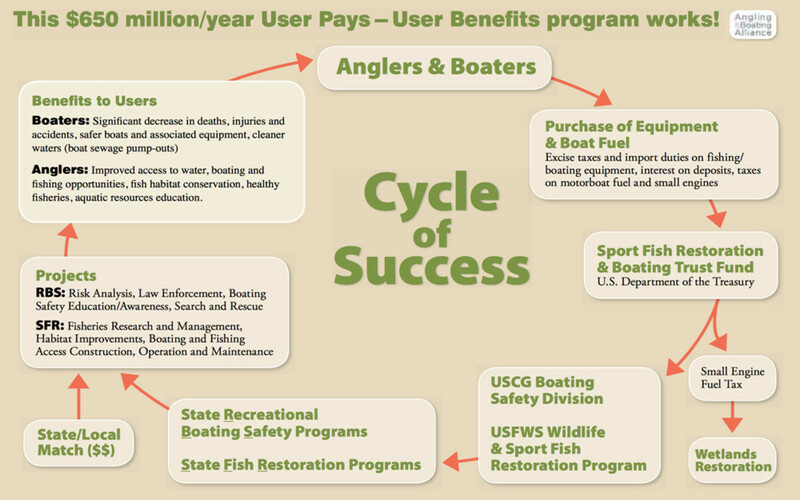 The cycle of success helps legislators understand that more programs lead to more people buying boats, which leads to a need for fuel and equipment, and it all cycles back to more money in the fund, Kennedy said. “I think it’s always a good idea to highlight this virtuous cycle to members of Congress,” Kennedy said. Because the transportation bill will come up for reauthorization, this is a timely issue to bring before Congress, he said. Kennedy and Jeff Gabriel, who is with the National Marine Manufacturers Association, were hopeful that the fund will be reauthorized, but they emphasized that it is important to highlight the fund in talking to legislators. “There are members of the Tea Party who don&apos;t look keenly on any taxes and think they all should be generated back to the state and that&apos;s where the opposition would be from,” Gabriel said in response to a question asking who opposed the measure. “But if you emphasize that this is user-paid and we understand the benefits,” they are likely to be on board.